Clarets leading scorer Andre Gray is refusing to read into the run-ins of the club’s promotion rivals as the race for the Championship title heats up. The 24-year-old, who is just a solitary strike behind the country’s most prolific forward, Leyton Orient’s Jay Simpson, feels the division is hard to gauge at this stage of the campaign, as the majority of teams have something to play for. England’s second tier has produced a plethora of shock results in recent months, with Rotherham beating both Middlesbrough and Brighton, lowly Charlton also stunned the Teesiders, while MK Dons held Aitor Karanka’s side and Hull City to a point, while defeating Derby County. “It’s going to be like that until the end of the season,” said Gray. “We probably have got the toughest run-in, but we’ve just drawn to Wolves at home and they were 13th. “It’s not always as easy as going and winning those games, you’ve still got to put a shift in. “You can look at the run-in, but Middlesbrough dropped points to Rotherham and Charlton, and people wouldn’t have expected that of them. “But the ball is in our court. “Before we had a look because they (Boro and Hull) had games in hand, and if they won them they could go above us, but that can’t happen now. “The ball really is in our court so it’s time to concentrate now. “Whatever happens around us happens. “We’ve got eight games to go and win, and if we do that, we know we’re champions. Burnley’s fate is currently in their own hands, and 22-goal striker Gray is looking to keep it that way as they prepare for a clash with Brighton after the international break. After the draw with Wolves at Turf Moor, he said: “We’ve got to look at the positives - we’ve won six on the bounce and drawn one. “If anyone had offered us that at the start of the run we’d have taken it. “We’re still unbeaten but there’s a long way to go. “We’re ahead at the minute and we need to stay there. With the fixture at the AMEX Stadium on the horizon, Gray added: “It’s not going to be the be all and end all there either. “It would be good to get the win and get something there. We’ve just got to get on with it. “If we win that it sets us apart from them by quite a big gap. Gray feels the pressure is off Burnley, who have been overlooked by many pundits over the course of the season as automatic promotion candidates. Boro, Derby and Hull City, with their transfer window outlay and depth of squad, were highly-fancied, and Gray admitted: “We’ve never played with any pressure this season really. I don’t think anybody expected us to do it. “Everyone was looking at the likes of Hull and Middlesbrough, they probably still are, but that’s football. We need to handle the pressure if there is any, but we know what we need to do. “I think we’ve passed the pressure test when going behind in games against Bolton and Fulham. We’ve shown the character that we’ve got, and if the pressure was going to get to us, then we wouldn’t have come out with three points. “We managed to so there’s nothing for us to feel pressurised about. 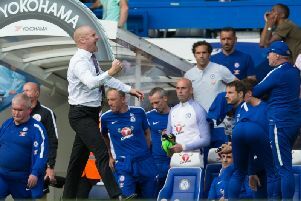 And Burnley’s ability to win games when not at their best could be crucial: “We’ve got to keep winning games – we’ve done it ugly and we’ve done it nicely – and we’ve got to keep giving 110%, which is what sets us apart from anyone else in this league. “There’s no pressure on our side. “I think that is what sets us apart. “When it’s cold, wet, windy, we can adapt and we can get on with it.